In collaboration with Eric Detweiler, Jon Stone, and Joel Overall, I co-organized the first Symposium on Sound, Rhetoric, and Writing in September 2018. 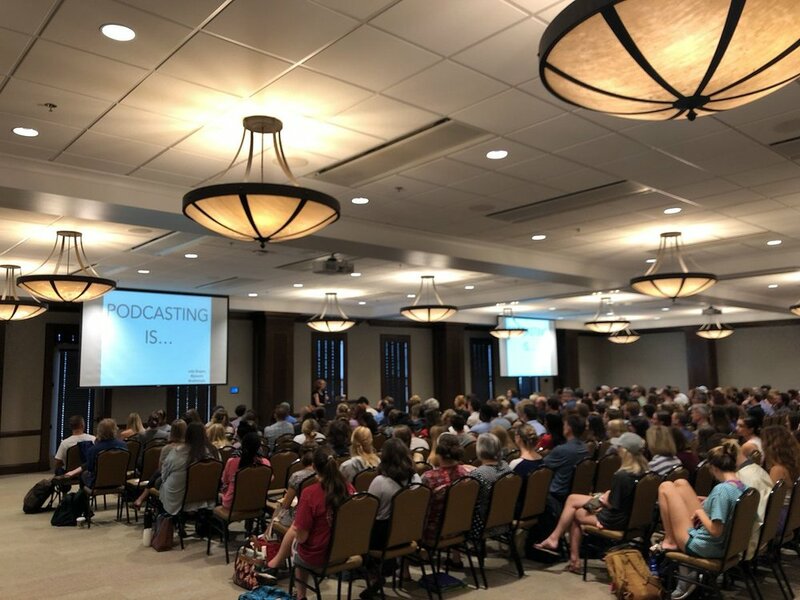 The symposium took place in the musical cities of Nashville and Murfreesboro TN and featured keynotes by Julie Shapiro, executive producer of PRX’s Radiotopia, and Damon Krukowski, author of The New Analog and host of Ways of Hearing podcast. We are so grateful to all of the participants and presenters for making this such a fun and unique experience. UVA Today published a story on my advanced composition course, "Writing with Sound." The article provides information about the class and touches on the significance of audio storytelling. It also contains student interviews and an example podcast project. In May 2017 I co-taught a seminar in Bloomington, IN with Jim Brown and Casey Boyle called Digital Rhetoric Behind & Beyond the Screen. From smart homes to smart cities, digital processes now underlie our everyday lives in ways that are difficult to see. While the computer screen has long served as a way to understand the demarcation between digital and non-digital, online and offline, we have entered a situation in which the line is fuzzier than ever. In response, this seminar asks: What does the rhetorician do now that digital rhetorics can no longer be confined to screens? In April 2016 I was interviewed by Eric Detweiler, host of Rhetoricity podcast. We talked sound, pedagogy, accessibility, food, senses, design, space, earbuds, and more. You can download this episode and many others via Rhetoricity's main site. You can also read a transcript of this episode. I had so much fun participating in the 2016 R-CADE Symposium at Rutgers-Camden's Digital Studies Center. The R-CADE gathers together people from across disciplines and fields to discuss and remake digital objects. This year's object is John McDaid's Uncle Buddy's Phantom Funhouse, a work of electronic literature published in 1992. McDaid's book, written with Apple's Hypercard software, includes 3.5 inch disks, print material, and audio cassettes. For my contribution to the symposium, I created a fake fan archive for Uncle Buddy's band, The Reptiles. You can view my full talk below, and see/listen to the entire archive on the R-CADE website. My article on sonic pedagogy, "(Re)Educating the Senses," was selected for the 2015 Richard Ohmann Award, which "recognizes the outstanding refereed article in the past volume year of College English that makes a significant contribution to the field of English studies." You can read more about the article and award on the NCTE Website. UMBC News published a story about my Fall 2015 Sound, Composition, & Culture seminar and our "multisensory dining experiment." This collaborative project required students to create original sonic compositions that complimented the visual design, smell, texture and taste of a prepared meal. The theme of the meal was “Comfort Food” and the goal of the event was for students to compose sound designs that—along with other design elements—would enhance and amplify feelings of comfort for our participants. My audio-visual piece, "A Tale of Two Soundscapes: The Story of My Listening Body," is included in the 2015 digital sound studies collection Provoke! A collection of print essays, which will serve as a loose companion to this digital work, will be coming out soon via Duke UP. Stanford Rhetoric and Writing Professor Andrea Lunsford blogged about my College English article on multimodal listening pedagogy. Read her thoughtful post. In December 2014 I was interviewed by a reporter from the Guardian about teaching the hit podcast "Serial" at UMBC. Read the full article. My article, "(Re)Educating the Senses," is the open access feature of the November 2014 issue of College English. Read it FOR FREE! The article features my interview with deaf percussionist Dame Evelyn Glennie, as well as some of her public lectures on listening (like this TED talk). This is the video of my 2014 MITH (Maryland Institute for Technology in the Humanities) Digital Dialogue. In this talk, I discuss how multimodal listening practices enable students to become thoughtful, savvy consumers and producers of sound in digital composing environments and in their everyday lives. A transcript of the talk is also available. Along with my stellar guest co-editor Jon Stone, I am proud to present the April 2013 Sonic Rhetorics issue of Harlot. To get a taste of the issue, check out our "Mashed Up" Intro. This is an oral history piece I produced with my grandmother about music as a connective force. It was published in Fembot's June 2012 Laundry Day Issue on feminist media production. It was also featured in SoundBox's Greatest Hits Volume 1. Listen below or read the transcript.